This post begins a series in which I will introduce Xamarin.Forms, put it in context and then teach all you need to know to go from absolute beginner to intermediate/advanced Xamarin.Forms programmer. I assume no prior mobile programming experience, though you will need to know C#. Xamarin.Forms allows you to create native iOS and Android (and other) apps in C# with a shared User Interface. With Xamarin.Forms you write to a common set of “controls” or “views” and these are translated to native controls when the program is created. Xamarin.Forms applications are indistinguishable from native applications because, by the time they hit the phone, they are native apps. How Do You Get and Set Up Xamarin.Forms? By far the easiest way to get Xamarin.Forms is to install them with Visual Studio 2017 or with Visual Studio Mac. The exact steps are available here. Like WPF and Silverlight, Xamarin.Forms UI is created using XAML. XAML is a highly expressive markup language not unlike a cross between HTML and XML. I won’t be teaching XAML here, but you’ll pick it up as we go (and I’ll explain it in detail as I use it). By the way: XAML is pronounced Zamel (to rhyme with camel) and Xamarin is pronounced Zamarin (which doesn’t really rhyme with anything). While it is true that anything you can do in XAML you can do in C#, resist the temptation to use C# for your User Interface. XAML is much more expressive, and virtually every demo and documentation of Xamarin will use XAML. Since these are moving targets, the images and templates may look a bit different from what you see on your own machine. I’ll name my first project TestBlog1. Mac: Begin with File -> New Solution. Under Multiplatform, select Blank Forms App and click Next. Perhaps surprisingly, you won’t be touching the latter two (platform specific) projects at all, at least for the first set of blog posts. If you are building your application on a Mac and you want to see it on an iOS simulator, things are pretty easy. Right click on the iOS project and choose Set As Startup Project. Now, at the top of VS Mac, set the third drop down to the simulator you’d like to use. If you are running on a Mac and want to use a provisioned iOS phone, just connect it to your development machine and it will show in the list with the simulators. 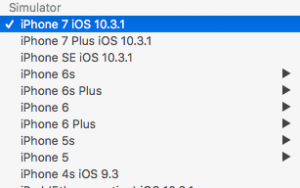 If you want to run the iOS simulator (or a phone) from the Windows machine you must have access to a Mac on your network (this is not true during development with the latest Xamarin.Forms on Windows). If you are building on the Mac you must make a connection from your Windows box to your Mac as explained here. To test on Android, you’ll need an Android simulator or an Android Phone. The phone is of course easier, but VS now includes an Android emulator that is quite good and amazingly fast (at least as compared with earlier emulators). Instructions for setting up Android emulators can be found here. There is a fair amount to discuss in this simple page. First off, the page is enclosed in ContentPage elements. The ContentPage designates a number of name spaces with the attribute xmlns= followed by the namespace in quotes. It also designates the class that this XAML relates to (TEstBlog1.TestBlog1Page). We’ll see that class in just a moment. A ContentPage can only have one element within it. Usually, that element is a layout element (such as a grid) which can, in turn, have as many elements as you like. Here, however, we have just a Label. In the next (and all subsequent) blog-post we’ll get rid of that label and replace it with a layout view so that we can have lots o’ elements on our page. Before I wrap up, turn the little triangle next to TestBlog1Page.xaml to reveal TestBlog1Page.xaml.cs This is the “code-behind” file. Any time you create a XAML file you’ll get one of these for free. As you’ll see in future blog-posts, we don’t use these a lot, but you can use them for all sorts of supporting code (we’ll be putting nearly all of that supporting code somewhere else once we get up to talking about MVVM). Right now, if you look in the code-behind class, you’ll see a using statement for Xamarin.Forms (the essential library for working with… Xamarin.Forms). You’ll also see a namespace (named after your project) and a class (TestBlog1Page) which derives from ContentPage. If you go back and look at the XAML you’ll see that the namespace is in the ContentPage element. Inside this class is a constructor which calls InitializeComponent. That is the one bit of code we’ll always have in the code-behind. It initializes the XAML, which we’ll discuss in detail in upcoming blog posts. That’s more than enough for today, but stay tuned for a good bit more, as I expect to turn out these blog posts fairly regularly. This entry was posted in Essentials, Xamarin and tagged Xamarin, Xamarin.Forms, Xaml. Bookmark the permalink. “an error occured. see full exception on logs for more details. Starting the emulator first (or leaving it running after the first failed deploy), doesn’t seem to help. What am I missing? This is recent clean install of VS2017. I started XF development a year ago with PCL based solutions. Well now .NET Standard is coming more and more, therefore I currently have a hard time migrating to .NET Standard. For every greenfield I could suggest to start with XF project, delete the PCL and add a .NET Standard library and reference that from the xplat projects. That prevents a lot of headaches. 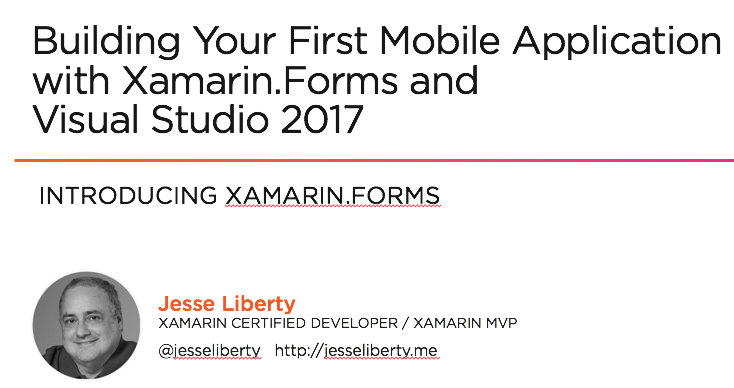 I was going to start new projects using Xamarin; but before start I was looking for some clean step by step training, Mr. Liberty is well known for doing just that and together with your tip I will save the time that I don’t have, Thanks a lot to both.